I love to have petunias tumbling over the stone wall in my back garden. It’s something I look forward to every summer. However, as every gardener knows, gardening is not like interior decorating. You can’t just find a great rug some place and make the best of it for the next 30 years. In the landscape, annuals, perennials, trees and shrubs, even the temperature and composition of the soil, the humidity of the air, the amount of sunlight falling through the sky, all the important variables are always changing! This spring, I planted many colors of petunias as per usual, gloating over my previous seemingly magical ability to make petunias trail over the wall like a Kentucky Derby winner’s blanket of flowers. As luck would have it, the first lot of petunias died. At least half of them turned brown despite my determined watering. Anybody who knows me understands how completely stubborn I am. Just because half my petunias perished was not cause for me to give up – I then planted a second crop of petunias, only to have those second round to fail in the very same location. Now let me add that I am extremely blessed because my gardener, Gabe Horrisberger, is also my client. Gabe helps me and I help him. I love what he does and he loves what I do. We had an official meeting to discuss the petunia situation. Both of us were completely stumped. In other words, is it true that what you think is a tragedy is actually a tragedy, or is the story about to turn in a second to a totally different resolution? Gabe and I decided upon another solution. Where once there were petunias, we planted seeds for tomatoes and basil. Of course, if you look at seeds, they don’t start out looking very promising – just tiny things you can’t ever really imagine amounting to much of anything. Then when they do sprout, you are never very sure if you haven’t just made a big crop of weeds. Finally the tomato plants started looking so much like actual plants that I drove over to ACE Hardware to buy myself six wire tomato cages. I stuffed them into the ground trying to be a bit more official, to put some order into the tomato jungle that appeared to be gathering. The rains came and the tomatoes kept growing hither and yon, ignoring my attempts to create order. 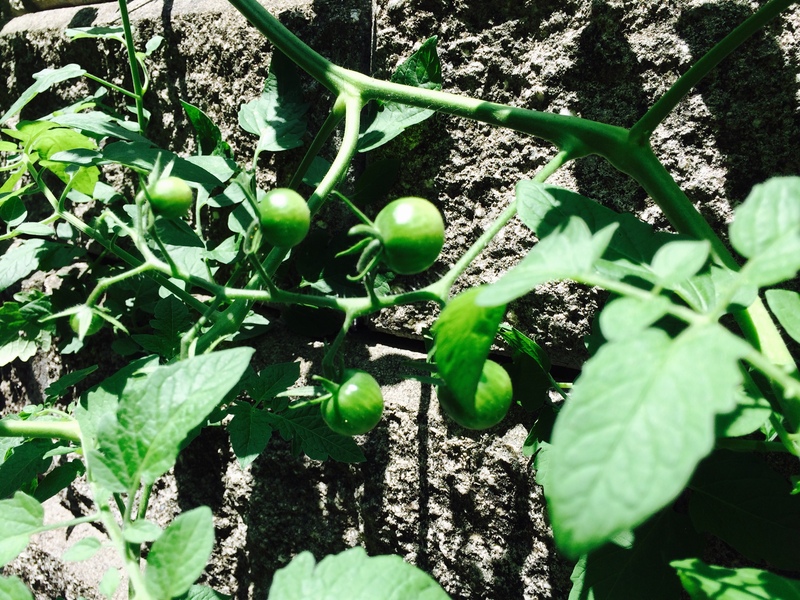 Instead of a blanket of purple and hot pink petunias trailing over the wall like I have in summers past, I now have a blanket of multi-armed green cherry tomatoes so abundant the walls can hardly contain the situation. I have many issues and one of these is my bad habit of getting attached to life being the way I envision it should be. Gardening helps me challenge my attachment to sameness and encourages me to be astounded by what could possibly come next.